Following a random meeting and subsequent lunch, Lou and I had agreed to take a one-week motorbike excursion through the mountains and jungles of Vietnam to create our own top gear special. Lou was decidedly excited for day two – waterfalls were on the agenda. We had been spoilt with some fantastic waterfalls on a random trip to the Blue Mountains on the outskirts of Sydney, Australia so our standards were set pretty high. Following that the waterfalls in Cebu, Philippines were also impressive in a different way, with beautiful colors and the ability to get in and swim too. With a couple more hours on the bikes to reach our destination we figured we’d need the rest to unwind and enjoy the area. We set off on the bikes again at 9am, Lou joined Anh on his bike again as the lead and I followed with Sant on the bike behind. Watching Lou on the back of Anh’s bike, trying to take photos at 50kmph, allowed me time to reflect and admire her sense of adventure, without her I doubt I would have got to experience anywhere near what we have done on this trip. The Vietnamese roads, much like the Philippines, are a free for all. The infrastructure here is a little better than the Philippines and the road quality is generally okay. However, traffic “rules” are similar. On two-lane roads or highways, any scooters or motorbikes will need to be comfortable on the hard shoulder when there are a truck and car occupying the two lanes. Similarly, and we learned this from being on the bikes, overtaking is sketchy – really it’s a game of high-speed chicken. At lunchtime, we arrived at the Dray Sap waterfalls. The area was quite busy and the main attraction for people doing bike tours through rural Vietnam. Safety is not paramount in Vietnam and we were left to explore the area. Much of the rock and stone was sharp, almost like slate, and difficult to walk across. As soon as we could get into the water and take the weight off our feet we did, behind some of the large rocks is a separate part of the waterfall where you can bath under the water. On one climb into a water pool next to the waterfalls I spotted a scorpion relaxing on one of the rocks – it made me much more hesitant to enjoy the water and I worked carefully to get around it whilst barefoot. In the afternoon we were back on the bikes in the sweltering heat. We took more frequent stops to sample same of the local farm life, this included eating the fruit from cashew nut trees, cacao beans, and farm tool construction. The stops helped us to appreciate the rural life for many Vietnamese people. Some of the farms still have undiscovered land mines which certainly adds to the apprehension when you’re walking through them. Our third day on the bikes was to be the longest. With the schedule set to cover nearly 300 kilometers we knew we’d be on the bikes for a good 7 hours. We covered more motorways during the day and reached the highest speeds we’d seen on the bikes. With broken speedometers on both bikes, it was hard to know exactly how fast we were going but Anh indicated the highway speeds would have been in excess of 60kmph. I was sure it felt faster than that, many of the open roads were also open to the elements so between dodging flies and butterflies we had some very strong crosswinds to deal with. Fortunately, our drivers were experts and experienced in navigating these roads. The time on the bikes for the day led to some very stiff and sore bodies. We arrived at our accommodation around 6.30pm. Anh had been dealing with a bad tooth so he headed directly for bed. We dined with Sant at a local restaurant and this again highlighted the beauty of traveling with Vietnamese guides. Lou loved trying new food and was keen to take advantage of any opportunity. With Sant, we arrived at a restaurant off a side street in the city, one we would have never found ourselves. For about $3 USD we dined on a whole duck cooked in a stew with vegetables and served with a bunh-mi to create your own duck roll. Like most food here we loved the unique flavors, it made a great end to a long day. For our fourth day, the pace softened. This allowed for more stops and a less intense day. One of our first stops was at a war memorial located at the southern end of the Ho Chi Minh road. 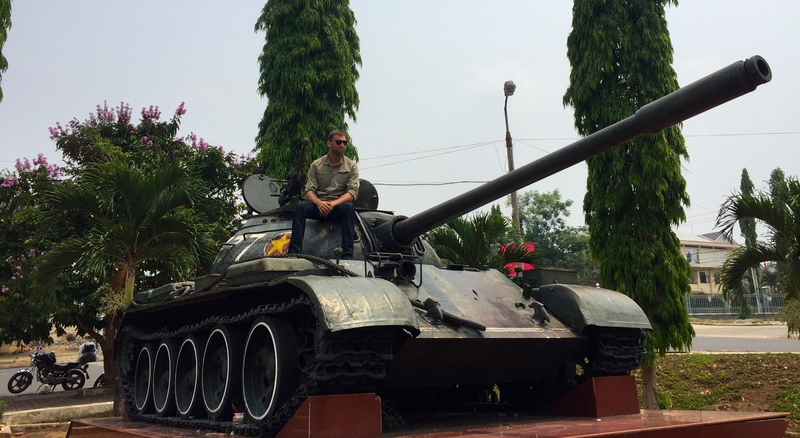 It was very eerie to see and explore the two Vietcong tanks parked the memorial. We couldn’t understand why people wanted to take photos in stupid poses with the tanks, to us they were reminders of the war and it seemed totally disrespectful to grab photos like this. Per the title image to this post, Lou got a shot of me on one tank, peering inside you could only feel sadness to what the soldiers experienced, very little space and comfort to endure the brutality of war. The Ho Chi Minh road leads up into the jungle. It is a fabulous route through Vietnam, with the twists and turns that made being on the bikes so much fun. I failed to see how you could enjoy the road like this from the front seat of a car and it truly validated the decision to take bikes. The mountains in the jungle provided some stunning views through the valleys. For me, this was the best day on the bikes. Lou also enjoyed this day on the bikes although I’m not sure if it placed higher on her list than the waterfall a couple of days ago. On one of our frequent stops Anh popped into a small shop and bought some sweets. In fifteen years of doing these tours, he has learned where all the villages are and we saved the sweets to give out to children in the village. In the jungle, many of the villages speak different languages that are dialects formed from combinations of Laos, Cambodian, and Malaysian. Anh and Sant can’t speak these languages but they have formed a connection with the people there and the children rushed out to see us knowing they would be getting some sweets! They crowded around Lou and we enjoyed the commotion. Dinner was at a nice hotel that was built during the gold rush at a small town in the jungle. Anh and Sant both dined with us for our last meal and we enjoyed sharing about six plates of traditional Vietnamese food including various fish, pork and vegetable stews. The food came with Anh and Sant’s special brew rice wine. If you ever get the opportunity to try rice wine in Vietnam, avoid it like the plague, the stuff tastes awful. I tried it due to some underlying obligation not to offend my hosts but immediately regretted it. The guys had two small bottles of the stuff that they polished off with dinner. Before leaving the town at breakfast Sant took me to a small shop where I brought some of the coffee and filters so we could continue to make coffee on our trip! The woman in the shop grabbed my nose when I was paying, something I found quite strange. She was smiling so I accepted it to be a positive expression! According to Sant, the Vietnamese women revere the pointed noses of westerners compared to the wider, flatter noses of the local population. I guess you always want what you haven’t got! We continued through the jungle with a stop to enjoy some fresh pineapple and jack fruit. Anh always stops at this particular house because the woman that owns the property sells fresh fruit to support her family. Her husband was severely dismembered due to the effects of agent orange. Through the funding provided by the US in the aftermath of the war, the Vietnamese government had paid for a house for them as compensation. We enjoyed her precision with a machete in cutting up the pineapple! Our final destination was the city of Hoi An, some 900Kms north of Nha Trang where we’d set off on Monday. On arriving in Hoi An we were immediately thrown into the local specialty – tailored clothes. The guys dropped us off at their favorite tailors which were about three doors down from our hotel. We were close to the ancient town area of Hoi An, the perfect location to discover this historic city. Our final task with Anh and Sant was to complete an entry into their guide books, effectively a notepad they used to collect testimonials from their guests. I wrote a thank you for them both, explaining that they had given me a new sense of trust in random meetings with strangers. I’m usually quite guarded and reserved when approached in the middle of the street but as I came to find out, this is fairly standard in this part of the world. Following the week on the bikes, it was a great time to relax and reflect on the week. I know that Lou found some of the week tiring, especially Day 3 when we did our longest biking stint. Having said that I know that she found the trip very interesting and really enjoyed the variety of local food that we got to try along the way, a real highlight for both of us. I loved our week long adventure through this beautiful country, it sparked my desire to learn about the people, culture, and history. This, for me, is the only way to do it.